Welcome to the fiftieth Weeknight Dinner Recap! Wow! This week was a bit less-than-traditional because it combined a partial week of cooking with partial week of travel. And that results in a week filled with a great variety of food! We cooked at home through Wednesday, then hit the road, back to Maine, for a few days of major relaxation, a lot of heat and humidity, and some serious summer fare. Read on for all of the delicious details! Sunday's Dish: OK, I have to admit, we did not make dinner on Sunday night. We had a big, late lunch and then well, we just weren't hungry! Outcome: No actual dinner-making happened, but I highly recommend a late lunch if you're ever not in the mood for a formal dinner. Late lunch (supremely early dinner?) is one of my favorites because by the time you're off to sleep, you're not quite as full as if you had eaten dinner at a more traditional time. Clearly, this is pretty rare, especially for us, but once in a while it's fun to switch it up. GFMD: While the original recipe called for cauliflower, not squash, we decided to mix it up due to a fresh delivery of squash from Seth’s parents. They gave us a squash bounty from their garden that had four (!) varieties of the veggie. Other than that change (just a swap really), there is nothing to change in the recipe to make it gluten free. Outcome: This is one of my favorite tofu-focused dishes from this book. It melds incredible flavors, a good portion of spice, and a terrific balance of tofu and veggies (squash in this case) to create an awesome, pretty healthy meal that tastes a lot more indulgent than it is thanks to the delicious red curry sauce. Of course, coconut milk is involved, but you know, you're not using the whole can and everything in the bowl is healthy so let's call it a wash. Who doesn't love coconut milk, anyway? It provides a hint of sweet to the curry and it's such a familiar, comforting flavor. I'm always excited when we make meals that involve coconut milk because they seem extra-cozy to me. Any time of year, for me, is a great time to have a delicious, curry-based dish. The tofu is cooked in a searing-hot wok which allows it to get ultra-crispy on all sides. It's brought back into the wok to mix with the other veggies and get a hearty coating of the red curry. While it's easy to over-crisp the tofu in this particular recipe, just be careful and try to keep it even despite your smoke alarm probably going off (ours did!). For veggies, we used a grand assortment of four (!) kinds of summer squash from Seth's parent's garden. Adding a new twist to the dish, I loved having the varying squash textures amidst the crispy tofu and scrumptious curry. The original recipe called for cauliflower, which worked really well, but for this instance we tried squash. I'd say the results were really delicious! Some of the squash tasted better with the curry than others, but in general I'd say it was a fun way to mix up one of my favorite red curry recipes. Fun facts of this dish: not only is it naturally gluten free, but it's also dairy-free and vegan! We don't always aim for those traits, but once in a while it's great to throw a meal like this into the week. I encourage everyone to try mixing up your plates. As long as it's gluten free, why not try a few vegetarian/vegan/dairy-free meals? You might be surprised by how much you enjoy them! Tuesday's Dish: Sautéed shrimp with Weeknight Cucumber Salad, side of corn on the cobb! GFMD: A beauty of a meal that was entirely gluten free! The salad recipe was naturally GF and the shrimp were simply sautéed with garlic, butter, and shallots, plus salt + pepper. Plus, the corn was naturally GF. So summery! 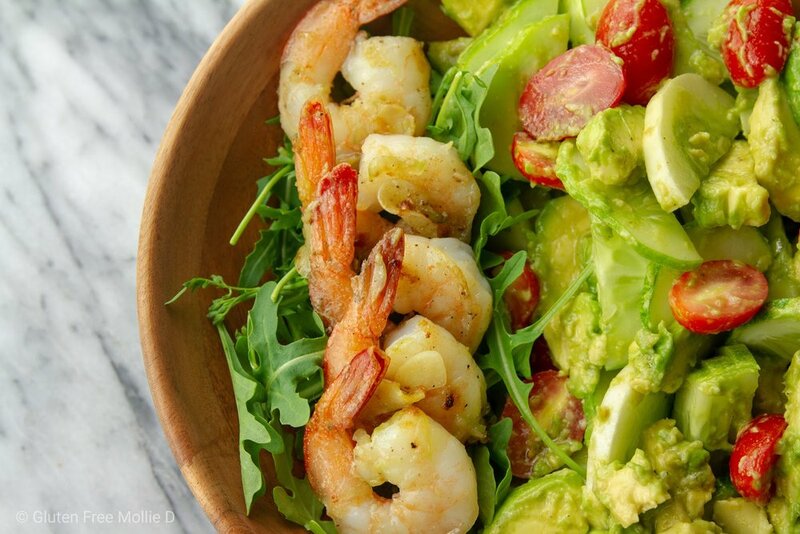 Outcome: What happens when you combine one of the best salads with one of the easiest, but most flavorful shrimp preparations? An awesome dinner, that's what. And while we're at it, let's have some corn-on-the-cobb too because it's summer, it's corn season, and we love it. The base for this dinner was the "Mom's Weeknight Cucumber Salad" from the cookbook mentioned above. One of the simplest, yet most delicious salads we've made recently and it just keeps getting better. Cucumbers, grape tomatoes, chunky avocado, and an easy balsamic-esque dressing come together to form a salad that's crunchy, creamy, and oh-so-yummy you won't mind that there isn't a lettuce leaf in sight. Honestly, I love these ingredients the most when in a more "normal" salad bowl so cutting out the lettuce seemed pretty natural to me. And the resulting dish is just excellent. The salad itself is a great meal, but I'd recommend adding in protein for it to be your dinner because no one I know should be that full from a bowl of cucumbers and tomatoes. Sure, the avocado does add some heft, a healthy fat of course, but the salad begs for an additional protein. Here come the shrimp! Luckily, we still had some frozen shrimp in the freezer which were quick to thaw and even faster to cook. Seth sauteed some garlic and shallots in butter, AKA best kitchen scent ever, then added the shrimp to the small pan and cooked them fairly quickly. Of course, shrimp are cooked through once they are pink all over. Yes, this will smell like heaven. Shrimp cooking is a quick process so it's best to make your salad first, keep it chilled in the fridge, then as soon as the shrimp are ready, portion out the greens and add the shrimp as a last step. You'll be eating your new favorite weeknight combo in no time. Of note, we had corn with this meal too because it's finally corn season around here and we cannot resist including it whenever possible. Speaking of corn, what is your favorite way to eat it? Personally, I love to "roll" the ear of corn in butter then sprinkle with a little salt and maybe pepper. Delicious! Sweet and salty and perfectly summer. Wednesday's Dish: Gluten Free elbow pasta with curly kale, andouille sausage, and shallots. GFMD: For all pasta dishes, we use gluten free pasta from Jovial Foods. It’s made with brown rice flour and water, that’s it! Straight from Italy, it’s always our go-to for any meal requiring this carb craving. Outcome: While we had held off from including pasta in our meal plans for a while, we are trying this new craziness called balance. As in, if we want to make pasta for one of our meals each week, we will do exactly that! I’ve been working hard to keep veggies aplenty in our dinners, but that’s totally possible when pasta is present too, which is what happened with this dinner. I love curly kale as a power-green so incorporating it into this pasta made total sense. And it was delicious! Hearty greens mixed with pasta is always a winner, especially with a few extra bold flavors mixed in as well. We chose andouille sausage for the protein because it cooks quickly, requires minimal prep, and offers a lot of yum amidst the kale and noodles. I’m sure other varieties would be great for this dish too (hello, hot Italian), but we liked the spice from the andouille for this particular version. Sauce-wise, we wanted to make this a little creamy so right before it was all done we added just a bit of creme fraiche. It added the perfect amount of creaminess without turning it into an Alfredo, but it did enhance the flavors overall. In fact, we probably could’ve added a smidge more, but that’s OK. There was still plenty of delicious-ness in every bite! For a dinner we threw together fairly last-minute, I loved the result. And I loved how all of the ingredients complimented one another without any one in particular being “too much.” I love a balanced bowl of pasta. While fairly straightforward in regard to cooking, they always make us happy, satisfied, and excited to try new, delicious ingredient combinations again! Thursday and beyond: We made it to the vacation side of the week! After Wednesday, Seth joined me in having some time off from work so it was officially time to celebrate! We stuck around our neighborhood until Thursday night then went north to Maine for a relaxing few days filled with sunshine and food. Iced tea with a view. Thursday lunch: for me, all great vacation days include going out for lunch. What says "I can do whatever I want" more than going out to eat in the middle of a weekday? So, we indulged and went to Legal C Bar in Lynnfield for a relaxing, midday meal! We shared fried clams, a requisite dish, and then I had a delicious crab and avocado salad which is one of the best salads, I think, because it's a great mix of veggies, the healthy stuff, and a lot of crab meat, the yum. We frequent this spot for it's convenient location, and menu filled with delicious gluten free options. Thursday night - Sunday morning: Off to Maine! While I could go on and on about the leisurely ocean-view walks, the fun times spent meeting up with friends who so happened to be in the same beach town, or the intense humidity that blanketed our entire trip, I'll spare you and just get to the goods: the food! Find below an extended version of Bar Bites: To Go covering every restaurant we visited during our time away. Each title is clickable and will bring you to that restaurant's website. Enjoy! Cornerstone: A favorite in the center of Ogunquit, this easy + casual restaurant offers a variety of delicious gluten free options including - their specialty - pizza! Made on GF crusts with every precaution taken, it is made in the same oven as the regular pizzas, so be aware of that when deciding on your order. They’re also much smaller than the standard pies, offering only four, small slices in each one. Pending how busy it is, I'll often choose a salad or the awesome stuffed peppers if I'm too nervous about the pizza area. Of course, trust your gut! Stick to non-pizza if that works best for you. On Thursday night, we shared a couple GF pizzas since it was late and the restaurant was not busy. They were delicious and I felt fine afterward. Also, I love to order a painkiller (basically a pina colada) on vacation and this spot has some of the best! I ordered mine without orange juice. Roost Cafe and Bistro: A quaint and quiet escape from the hustle of the village center, we love this restaurant for the expansive gluten free breakfast menu! Offering everything from eggs to pancakes, omelettes to biscuits, your GF breakfast needs will always be met. It's so good we went here for breakfast both mornings of our trip! And to be super-exciting, I had the same dish on both days! A scrumptious veggie omelette with Swiss cheese and a GF biscuit is my new go-to because it was simply excellent. Yummy and filling, we weren't hungry again for several hours. Win! Barnacle Billy's: A classic must-visit in Perkins Cove, we stopped by for drinks on their great outdoor deck for a while on Friday afternoon to watch the boats sail by and to embrace "vacation mode." The menu is filled with seaside musts including lobster rolls, chowder, and grilled hot dogs. While we didn't order food on this particular trip, I usually order bun-less hot dogs, a lobster roll (no roll), or chowder/lobster bisque because they are both gluten free! This restaurant has been in the Cove for decades and it's someplace I always recommend to visitors - classic Maine food in a very summer setting. Relax and enjoy! The Trap: We popped over to this small, ocean-view restaurant thinking we'd have a quick snack. Little did we know their gluten free menu options would be vast and glorious! Things must have changed because last time we visited, nothing fried was an option, but this time around I could basically order anything I wanted! And so I did. Feeling free and excited, I had a cup of clam cowder and crab cakes, and shared delicious mussels with Seth. He had a oyster po' boy which I could have had too, since GF bread was available. My meal was delicious and a terrific surprise. Not only did the menu offer all kinds of seafood selections and even (safely) fried food, the view while you eat can't be beat! We'll definitely be back. So Zap Urban Thai Kitchen and Bar: We came here for the first time during the July 4th holiday and couldn't wait to go back! Seriously delicious Thai food in the center of Ogunquit! Offering plenty of gluten free menu options and even more if you ask for specific ones to be made with GF soy sauce, this restaurant is a welcome change from the standard seafood that's quite plentiful in this area. Not to say I don't love a lobster, but having Thai food as an option during a seaside vacation is a delight! We shared two kinds of curry and Thai fried rice before it started pouring and our lovely outdoor table was getting soaked. Good thing we ate quickly! A delicious meal and kind staff, as always, there was a line out the door when we arrived. A popular spot in the center of this relaxed beach town. The Dockside Grill: On Saturday, we traveled a little north of Portland to visit Seth's cousin and his wife. They recently moved to the area and bought a house! So to celebrate and catch up, they brought us to this great little restaurant with a terrific ocean view and yummy sea-focused fare. With a menu marking GF dishes as such, I had plenty to choose from and decided on a shrimp cocktail and a tuna poke salad. Yum! Enjoying a delicious meal while catching up with friends and having an ocean view is a summer scene that will always be a favorite. This spot had a lot to choose from, food-wise, so I'm sure we'll be back to visit, and eat more seafood, very soon! Beachfire Bar and Grill: Since the weather Saturday night took a turn for the rainy and stormy, we went to a new-to-us restaurant close by right before the rain pounded the pavement. Despite the storms, this restaurant was packed! We waited for bar seats, had a drink, and then got to reviewing the menu. Wow - over 95% of it was available gluten free! With a dedicated GF fryer to boot! I was so excited I almost ordered everything. Thankfully, I came to my senses and zeroed in on the good stuff. Seth and I shared GF fried mozzarella, fried clams (so amazing), and an order of nachos with pulled pork. Clearly, this meal was all about comfort food and throwing caution to the wind in terms of health. It was the last night of vacation so we just enjoyed and decided to worry about it later. However, the nachos were an actual mountain so we should probably have ordered the smaller size. Next time! Backyard Coffeehouse and Eatery: A quick stop before we hit the road, Seth loves the high-quality cold brew, homemade baked goods, and free parking. I appreciate the GF bread available for breakfast sandwiches as well as the selection of packaged GF pastries from the Something Sweet Without Wheat bakery available for purchase. This time around I had a ginger lemon iced tea, surprisingly refreshing, and Seth got coffee and a scone. A great place for breakfast or lunch because it's very centrally located, and one we frequent for it's much-appreciated GF options. Well, we hope you had a great week and have been enjoying the summer! We're back home now and will be cooking all week (see you later, nachos!). As always, thank you for reading and for following along.